Welcome to our stop on Seven Black Diamonds tour for Melissa Marr. This tour is hosted by Rockstar Book Tour. This riveting fantasy marks Melissa Marr’s return to the world of faery courts that made her Wicked Lovely series an international phenomenon. Lilywhite Abernathy is a criminal—she’s half human, half fae, and since the time before she was born, a war has been raging between humans and faeries. The Queen of Blood and Rage, ruler of the fae courts, wants to avenge the tragic death of her heir due to the actions of reckless humans. Lily’s father has always shielded her, but when she’s sent to the prestigious St. Columba’s school, she’s delivered straight into the arms of a fae sleeper cell—the Black Diamonds. The Diamonds are planted in the human world as the sons and daughters of the most influential families and tasked with destroying it from within. Against her will, Lilywhite’s been chosen to join them...and even the romantic attention of the fae rock singer Creed Morrison isn’t enough to keep Lily from wanting to run back to the familiar world she knows. Melissa Marr returns to faery in a dramatic story of the precarious space between two worlds and the people who must thrive there. The combination of ethereal fae powers, tumultuous romance, and a bloodthirsty faery queen will have longtime fans and new readers at the edge of their seats. She took a step closer to him. Lily reached out and touched his wrist. She wanted to deny everything, but she couldn’t lie again. Not to him, not right now. Creed reached out and covered her hand with his. She moved to him obediently, grateful for the familiarity of being at his side at a party, grateful to have a routine to fall into instead of whatever was happening with Creed. Daidí extended a hand to the boy, who accepted it easily. Her eyes widened just enough that Lily was glad Daidí was frowning at Creed instead of scrutinizing her. Creed smiled, a genuine soul-searing smile that she’d rarely glimpsed in the hundreds of photos she’d seen in magazines, and then with a nod to them both he walked toward the stage that had been set up for him. At her side, Daidí was silent as they walked to the table at the front of the ballroom where she was to sit like a regent holding court. For all of her father’s suggestions that she mingle with those her own age, he still set her apart. Soon, his colleagues would come and give her gifts. Shayla would arrive and catalogue them, and Daidí would nod approvingly. Everyone would pretend that the people her own age who did approach her did so by their own choice. All the while, she would watch Creed sing for her as if private concerts from global celebrities was her due. “He’s like you,” Daidí whispered as he seated her at the birthday table. It was a question as much as a statement. On stage, Creed inserted a little earpiece into his ear and nodded at the man who was stationed to the side at a complex looking control board. Creed felt more familiar now, like the unapproachable rockstar in her fantasies. He was safer now that he was at a distance. “I thought as much from the way you studied him in those journals,” Daidí said with a satisfied tone that made her glance his way. “You can with him,” he said. When Daidí straightened again, she knew that her father had his people thoroughly investigate Creed. No one was admitted to Abernathy Estates without thorough background searches. As Creed started the opening chords to “Deadly Girl,” his eyes were fixed steadfastly on her and her father. She could feel his words like a lure. Air. Creed Morrison’s affinity was air. The articles she’d read all explained that fae-blood were typically associated with one element. Those of purer fae lines had a second. True fae had two or sometimes three. Nothing explained why she had four, and she’d never met another fae-blood she could ask. Here, though, was one in her home. Lily glanced from her father to Creed and back again. “Happy birthday, Lilywhite,” Daidí said. The real present wasn’t the party, or the jewelry, or even the concert. Her father had delivered Creed Morrison to her like a gift. All he needed was a bow. 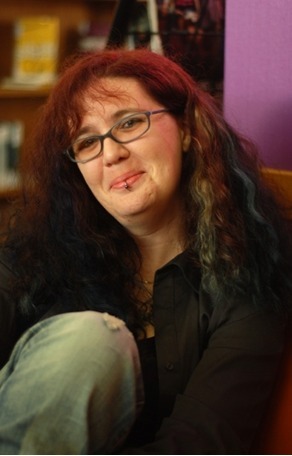 Melissa Marr is the author of the bestselling Wicked Lovely series as well as the adult fantasy novels Graveminder and The Arrivals. When not writing, editing, or traveling, Melissa is buried under a plethora of books, dogs, and children in Virginia or online. 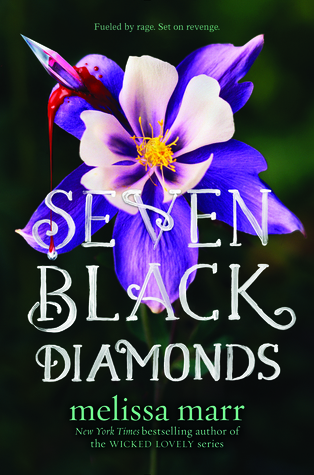 6 winners will receive a finished copy of SEVEN BLACK DIAMONDS, US Only. Thanks! Love this scavenger hunt, but I'm also not seeing the secret code word.